Paulette Lerman, from Franklin, Michigan, is a wonderful lady who is very devoted to the concept of Rescue. This real handsome big red guy is Alex, her fourth foster Golden. He was sadly given up by a man who had become homeless and was livin g in his car in order to keep Alex with him. This man really loved this special boy, but knew that he would never be able to go to a homeless shelter or get an apartment if he had a dog. It sure took a real lot of courage when he turned Alex over to rescue. He knew in his heart that his boy deserved a better life than he could give him. Paulette and her Golden Gal Sadie became Alex's foster family, and they fell in love with him. Just look how content he looks as he drapes his head over Sadie. Foster placements are temporary, while inquiries are made to get more information or to come and visit. But, when a family finally did show an interest in adopting Alex, Paulette cried all day. She knew, then, that she could never give him up. So, on the fourth day in her home as a foster placement, Paulette adopted Alex. She never got to meet his first human companion, but thinks about him all of the time. Paulette can easily imagine how much he must miss Alex. It sure was an unselfish thing for him to do to give up this sweet boy, as Alex was surely his last and most prized thing in the world. Paulette always believed that Alex seemed more human than dog-like, as there was something very soulful about him that touched all that met him. He naturally drew people to him, no matter they went. In only two months Alex met the requirements to pass his CGC and TDI exams. Now, that's impressive! He gave so much comfort to so many, and even was able to touch kids who had been afraid of dogs before their meeting. Paulette celebrated Alex's life everyday that he was with her. But, it wasn't until he went suddenly and unexpectedly to the Bridge, that she finally realized what made him so soulful. Surely, Alex was an angel, something she never really believed in until he so sweetly touched her life. Just two weeks before Alex died of bloat, Paulette had given him a one-year adoption anniversary party. Sadie was there along with seven of his best doggie friends, enjoying their cake and Frosty Paws ice cream! 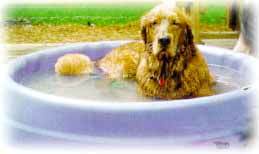 See him looking so silly in his swimming pool? Well, that's the picture they used to make his cake. 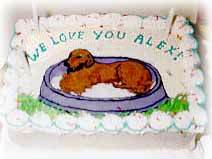 Alex was lovingly buried in Paulette's backyard in his own little garden. There is a beautiful little bush on his grave that has Golden Retriever angels on it. Alex is missed terribly, but hopefully is now resting in peace. And, Paulette is certain that he is watching over them as he is now their Guardian Angel. 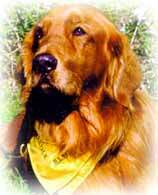 ~ Paulette is affiliated with Golden Retriever Rescue of Michigan (GRRoM). 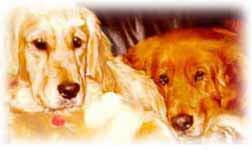 They recently (April 2001) celebrated having had 1,600 Goldens adopted!